Buy Andrew Mack Brush Company Brushes for Sale here. 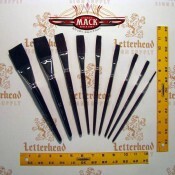 Freehand Lettering and Pinstriping brushes made by Andrew Mack Brush Company, pinstriping-lettering worlds favorite brushes for hand lettering and hand pinstriping The Andrew "Mack Brush" Company Story Although the Andrew Mack and Son Brush Co. was founded in 1891, its history goes back to 1865. It was during that year that J.J. Deal founded his wagon and buggy factory in the small village of Jonesville, Michigan. The Deal factory quickly gained the reputation of building the finest carts, wagons and carriages in the Midwest. The products were first class in every detail - even the paint! It was with this emphasis on quality that the Mack Company made its contribution for several years prior to 1891. Andrew Mack (1860 - 1946) had been the head striper at the Deal Co. Andrew was a true perfectionist and he had never been completely happy with the quality and performance of the striping brush furnished by the Deal Co. 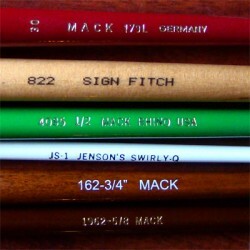 Through months, and probably years, of experimentation with various brushes, Andrew finally developed what is now known as the "Mack Striping Pencil". All carriages carried a great deal of pinstriping during this period of our country's history. It wasn't long before other companies and pinstripers throughout the United States heard about Andrew's improved striping brush and wanted to secure a few brushes for their own striping needs. Soon the demand for Mr. Mack's brushes was so great that it was time to strike out on his own and enter into the manufacture of striping brushes. Andrew Mack resigned from the Deal factory in 1891 and was destined to originate one of the most unique manufacturing companies in the world. Since Andrew Mack died in 1946 (at the age of 86), the early history of his company is very sketchy at best. We know that he operated his company out of several buildings and homes prior to his death. We understand that in the 1930's there were over 30 ladies working for him full time manufacturing just the pinstriping brush. Of course, one must remember that this was the heyday of pinstriping (no tape, rollers, spray or air brush guns were on the market at that time). Andrew's son, Glenwood, was involved in the family business on and off from 1911 until he took over full ownership in 1946 upon Andrew's death. From 1946 until 1961 were the years of experimentation for the Mack Company. Glenwood spent countless hours in quality control and time studies. He entered the photographic market with a brush that was used in cleaning camera lenses. He contracted artist and sign writer brushes from a company in New York called "Art & Sign". He developed this art and sign writer business until it accounted for about 25% of the overall sales. However, by 1961 Glenwood was 72 years old and it was time to step down and enjoy life. Jon M. (Mike) Fast (pictured with his son Chris Fast), a friend of the family, purchased the business in 1960. He was a junior at the University of Michigan Business School at the time, and has continued as the president of the business to the present date. Sales, through inflation and growth, have increased many times over the years, and the Andrew Mack and Son Co. is more viable and diversified now than at any other time in its history. The Company continues as the world leader in quality pinstriping and touch up brushes, but they have also branched out into many other allied areas. One of the fastest growing areas and also the most gratifying has been developing new and unusual Brushes for the Sign Painter. The Pinstriping Brush that is manufactured today is essentially the same brush that Andrew Mack first made in 1891, (although many of the leading stripers in the world would give anything to get hold of one of those "Old Mack brushes"). The pinstriping brush is totally a hand-crafted operation, just as it was in 1891. There is not one piece of machinery used in its manufacture. It is completely manufactured in Jonesville, Michigan, by eight to ten very talented technicians. The squirrel hair comes from the cold regions of the Siberia and Northern China. Many attempts have been made to raise squirrels or use the tails from Northern Canada, but the quality just isn't there! 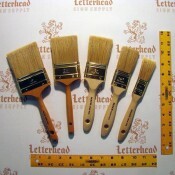 By the way, our brush, as well as many other artist and sign writer brushes, have always been labeled "Camel Hair." This couldn't be farther from the truth. There is no such thing as "Camel Hair". It was a name given to squirrel and other animal hair a long time ago. Most of us have been afraid to drop the label for fear of losing you as a satisfied customer. The hair that we use in our striping brushes is 100% unmixed squirrel hair and the brush is made in America by Americans. This is a statement that no other pinstriping manufacturer can claim. The Andrew Mack Brush Company is rich in history and pride. 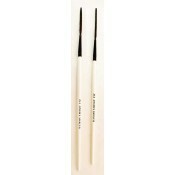 We are the originators of the Pinstriping Brush, and we feel that we still give you the very best brush in the world. I am sure Mr. Andrew Mack would be proud of his company today. I am certainly proud to be the present owner. My wife, Betty, and I have been the active owners of the company since 1960. We are extremely fortunate that our son, Chris, has chosen to "come home." He joined the family business in the Spring of 1997. To date, he really enjoys the business and it will be great to have The Brush Company remain in the Fast Family. We have had great, dedicated employees through the years. It has been a challenge to develop new products and ideas these past forty years. We have all enjoyed a fantastic relationship with you. - "The Best Customers Ever!" Jon M. Fast The following poem was taken from an old Andrew Mack catalog. When drawing stripes, both broad and fine And what is more a double line You're never safe from a man's attack Unless your stripers come from Mack. Testimonials (taken from an old Andrew Mack catalog, Circa 1930) Mr. Andrew Mack, Jonesville, Michigan My Dear Sir. ... We are very pleased to add our testimonial to a number which we presume you have, as your goods have proven very satisfactory, and we have used them for the past four years. We assure you that as long as the quality you are giving us at the present time is maintained, we shall not look around very much for sword stripers. R.B. Resending, Purchasing Agent Buick Motor Company Flint, Mich.
Andrew Mack, Jonesville, Michigan Dear Sir.... Your favor of the 12th at hand. We wish to state that your stripers have been well adapted to our requirements and we have found them in all ways entirely satisfactory. The Toledo Metal Wheel Co. Toledo, Ohio Speaking of Brushes... The brushes we use for painting signs and pinstriping all come from one of these two types of material that form the tuft of a brush. Natural Hair. No animals are raised or trapped for the sole purpose of making a brush. Natural animal hair may be used in its pure state or mixed with other types of hair to accomplish a particular mixture for price, and or, performance, Natural hair will hold a tremendous amount of paint, because it has microscopic scales along the shaft of the hair. Quality and price of natural hair is determined by the grade of animal, and by supply and demand. Generally speaking, longer hair is harder to find and more expensive than the shorter lengths. Synthetics Synthetics are man-made of either nylon or polyester. 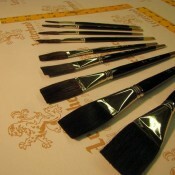 They may come tipped, tapered, flagged, abraded or even etched to increase the brushes' ability to carry color. The man-made filaments may be dyed and baked to make them soft and more absorbent. The advantages of a synthetic brush are as follows: They are very durable, They are less likely to be damaged by moths, paints or mild solvents. They are easier to clean. 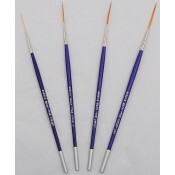 If you are using an acrylic paint, use a synthetic brush. Types Of Natural Hair Squirrel Camel Pony Ox Red Sable Sableline Kolinsky Sable Bristle Squirrel Hair Natural Squirrel hair for hand lettering, pinstriping and painting brushes Blue squirrel is the most readily available and comes in long lengths, as well as short lengths. 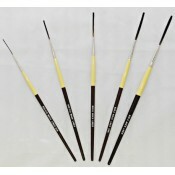 It is generally used for striping brushes and lettering brushes. Brown, or kazan, is no longer as plentiful as it was several years ago. It is generally found in the shorter lengths and used for stripers, quills, and outliners. Both blue and kazan are very soft and fine. They point as well as kolinsky, but have very little snap, since the hair is not very resilient. Grey squirrel is the hardest to find and the most expensive. 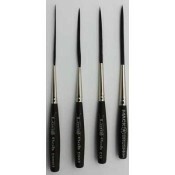 It is more durable, has more snap and makes a great quill or lettering brush. 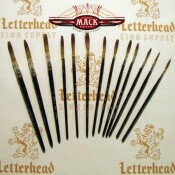 Camel Hair Natural Camel hair for hand lettering, pinstriping and painting brushes There are no camel hair brushes. 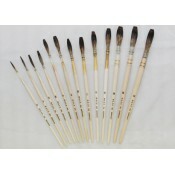 Camel hair brushes received their name from "Mr. Camel", who invented them. Camel hair could be squirrel, ox, pony, goat, or a blend. Pony Hair natural Pony hair for hand lettering, pinstriping and painting brushes It comes from an animal that is at least two years old. It is very strong, but also soft. The very finest pony hair comes from the belly of the animal. 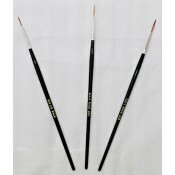 It is often blended with other hairs for less expensive watercolor and touch-up brushes. Ox Hair natural OX hair for hand lettering, pinstriping and painting brushes The best ox hair comes from the ears of cattle or oxen. It is very silky to the touch. It is also very strong, resilient and has good snap. However, it lacks a fine tip, so it is usually mixed with other natural hairs. 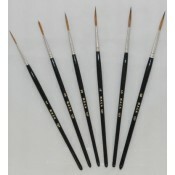 The blending makes a brush more resilient and have more body. Red Sable natural Red Sable hair for hand lettering, pinstriping and painting brushes This hair comes from any member of the weasel family that has red hair. It does not come from the "sable" animal. 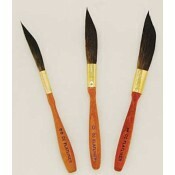 It is used to make a lot of different brushes, and there is a big variance in quality when one speaks of "red sable". The good quality red sable can be used as a less expensive alternative to kolinsky. Quite often, red sable is blended with ox hair to make a more economical brush, but unfortunately, the fine point is sacrificed. Sableline natural Sableline hair for hand lettering, pinstriping and painting brushes This is normally light color ox hair that is dyed to look like red sable. Some lettering and watercolor brushes are made with sabeline, mixed with sable, to lower the cost of the brush. 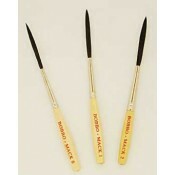 Kolinsky Sable natural Kolinsky Sable hair for hand lettering, pinstriping and painting brushes It comes from the tail of a mink. 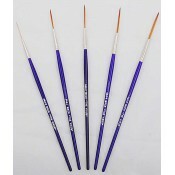 it is the best hair for watercolor and oil brushes because of its strength, spring and snap. It comes to a very fine point, and with proper care, will last many years. 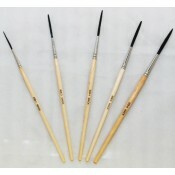 Bristle natural Bristle hair for hand lettering, pinstriping and painting brushes It comes from hogs in different parts of the world, but the very best comes from China. Hog bristle is different than any other natural fiber, since it forms a V-shaped split or "flag" at the tip, and has a natural curve. This gives it a resistance to fraying and it spreads paint smoothly and evenly. The Care and Feeding of Sword Brushes by Annabel Sherwood How to Choose, Trim, and Maintain A Pintriping Brush How to Choose, Trim, and Maintain A Striper's Best Friend Imagine loading up a favorite striping brush with paint, only to have it shed hair all over the palette; or reaching into the trusty kit, only to discover a bunch of gnawed sticks. Believe it or not, many products stripers have sworn by in the past can actually cause brush hair to fall out or be eaten by mice. While these are worst case scenarios, poor maintenance can ruin a brush. However, with the proper care, a brush will last indefinitely - or at least long enough for its owner to make a reasonable profit with it. Like many aspects of pinstriping, the basic rule for choosing, trimming and maintaining brushes is whatever works. As one painter puts it, "Ask 10 stripers and you'll get 11 different opinions," Although this is true, there are several commonly agreed upon ways to ensure sword brushes have a long and prosperous life. A good craftsman takes proper care of his tools. For top performance, nothing beats a properly trimmed, cleaned and stored sword striper. Choose Your Weapon! There are two main tools to choose from when it comes to pinstriping - swords or daggers. Often referred to synonymously, each brush is distinctly different. " The sword's longest hair is on the top and then it slowly tapers back to a short length on the underside. A dagger comes to a point and is double-edged, explains Rick Glawson, owner of Wilmington, Calif.-based Fine Gold Sign Co. and Esoteric Sign Supply. Although daggers are useful for small, curved work, versatile swords remain the brush of choice for most stripers. The sword brush originated on the early assembly lines, used mainly for automotive paint touch-ups. 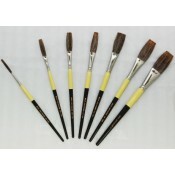 Over the years, brushes have evolved to better suit pinstripers' needs, with short and long handles, large and small bellies (the middle section where the paint is carried), and different kinds of hair - squirrel hair being the most commonly used. 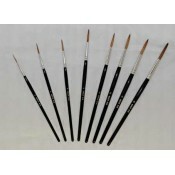 Brushes range in cost from about $6.50 to $25, depending on their style and manufacturer. Each company has their own scale for sizes, usually designated by numerals or a series of zeroes. The bigger the number, the more hair in the brush, the more paint it holds, and vice versa. Selecting a brush is largely a matter of personal preference. " It depends on what fits into the person's hand and what they have the greatest comfort with," says Wappingers Falls, N.Y.- based striper Howie Nisgor. However, he does suggest a shorter handle length for beginners, since it gets up inside the hand for greater control. Testing out different brands and types is an ongoing trial and error process for most painters. " You don't really know what kind of brush is right until you've got it wet and you're actually using it," says Nisgor. Peter Millar of Quill Hair & Ferrule, a brush distributor in Columbia S.C. agrees. " Its highly individualized as to what works for the individual person. It also depends on what kind of work they want to do," he says. 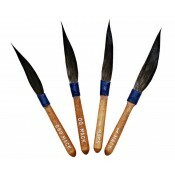 For painting curves, Millar recommends brushes that have little hair in the belly section. " If you have a lot of hair in the belly and you go to make a tight corner, the hair kicks out and causes your line to go fat," he explains. Conversely, pulling long lines requires a thick belly. "Ideally, you want something at least five or 10 feet at a time or more," says Julian "Mr. J" Braet, a Lyndhurst, NJ. based striper and inventor of the Xcaliber brush. "Everybody has their own favorite," he adds. And what do stripers do after finding a favorite? What else, they customize it. 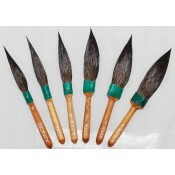 The Brush Cut Manufacturers and painters are divided on the subject of trimming brushes. Although most brush companies discourage trying to reshape any part of the brush, trimming is widely practiced. "Almost every pinstriper isn't happy with the brush when they get it, " says Mike Fast, owner of Jonesville, Mich. based brush manufacturer, Andrew Mack & Son Brush Company. "We don't advocate trimming, because you take the softness away if you trim it to much," he says. Even so, he accepts the fact that most stripers work with trimmed brushes. "That's the way a lot of stripers do it, and that's fine," says Fast. Brushes are made of three sections - the root, where the ferrule (the wire band or thread that keeps hairs attached to the brush) is located, the belly section in the middle, and the end tip. 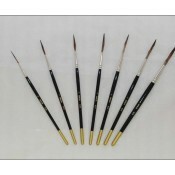 Most artists either blunt the normally pointed tip of the brush, or slightly alter the belly. Because a water-soluble sizing is used to keep brushes stiff during shipping, they need to be cleaned right out of the package. " A lot of people don't know what to do with sizing, so they throw the brush into a bucket of water and let it soak until the hair floats free, and it starts losing hair when they take it out," says Glawson. Instead of soaking it, he suggests holding the brush under a stream of water, putting a dab of dish soap in, washing it out, and then drying and oiling it. After the sizing is rinsed out, the brush is ready to be shaped. Nisgor's procedure for trimming the tip is to wet the hair, lay it flat down on the palette and put the razor blade straight down through, with a small, quick clip off the tip. "I blunt the tip on a 45 degree angle, going from top left to bottom right, aiming back towards the handle." Yuba City, Calif. based striping veteran Jim Bradley also trims up the point of the brush, cutting off about 1/16 of an inch. "I like the intersections of my lines to be really square," he explains. In addition to trimming the tip, some stripers take a little hair out of the belly to achieve tighter lines and sharper curves. This is usually done by taking a few hairs off at the root of the brush. Both of these techniques must de done very carefully. "If you take to much out of the belly section, the brush will lose its snap and the ability for the paint to flow out of the brush in a consistent manner," explains Millar. When this happens, painters get what are called dry stripes, which means the paint isn't flowing out smoothly because there's too much hair at the tip of the brush. " The biggest mistake people make in trimming a brush is in trying to cut too much hair out of the brush to re-shape it," agrees Nisgor. "If you try to alter the belly of the brush, you alter the entire flow of the paint. I think you're better off trying to get a brush you don't have to modify much," he says. Lather, Rinse, Repeat After a quick rinse, a careful trim and some serious striping, it's time for the most important, and least exciting step- cleaning the brush. How this is done depends on when the brush will be used again and the type of paint - lettering enamel, acrylic lacquer, or urethane enamel. Most stripers paint with lettering enamel, since it wipes off easily and is less harsh on the brush. 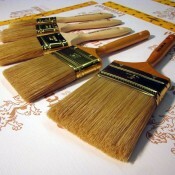 Expect a much shorter life span from a brush when using lacquers and urethanes. 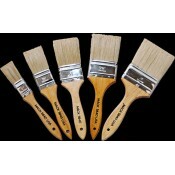 These paints dry faster and their solvents can eventually dissolve the glue holding the brush together.' According to Millar, the trick is to use a nice blend of solvents that are strong enough to loosen up the paint, but mild enough not to damage the glue compound, and that varies from brush to brush. As a rule, it's best to use the brand of reducer or thinner prescribed for the paint. For lacquer-based paint, use lacquer thinner, for urethane enamel, use urethane reducer and for lettering enamel, use the same brand of reducer or mineral spirits. For day-to-day striping with lettering enamel, most artists don't entirely clean out the brush. " I just put it in a mixture of half brush conditioner and half mineral spirits, and lay the brush flat down in a pan," says Nisgor, crediting Blairstown, NJ based painter Alan Johnson with the method. To completely clean a brush, Nisgor gives it a quick rinse and suspends the brush from a clothespin in a tall container of thinner, so the paint is drawn out of the brush to the bottom. He picked up this trick from Canonsburg, Penn.- based striper, Bill Beckner. Once the paint is out of the brush, Nisgor puts it in a mixture of thinner and brush cleaner, and gives it a final rinse with thinner before oiling it. Mr. J opts for a slightly different method, using dirty reducers to get the majority of the paint out of the brush, then cleaner reducer, some new mineral spirits, and lastly, Xcaliber brush preserver. " I get as much of the paint out as possible, not scrubbing it, just washing it out well. Then I drag it across a paper towel and then, of course, oil it well," he says. Brush Oils Checking The Oil Stripers have been known to use Neatsfoot (beef oil), linseed oil, olive oil and vegetable oils, but any type of food based product tends to either lose its viscosity or get gummy. Automotive and lard oils also pose problems. " Painters have stored brushes in transmission oil and motor oil, and that was okay in 1930, but there have been so many strong detergents and other additives put in the oils that make them better for cars, but worse for brushes, " explains Millar. The trouble with lard oil in the old days, bad distributors would sell raw unmachined lard oil to save money, besides coagulating on the brush in cold weather and making a watery mess in the summertime, it can also go rancid or attract vermin like mice and cockroaches. Now theres a solution with Machined Lard Oil like Gilder's Brand of Lard Oil, so that your brushes will last the longest. Machined Lard Oil is also heated above 165 degrees that eliminates the Protein Strands and Collagen. It is these Protein Strands and Collagen that attracked mice and insects, futher more these pest are attracked to hair for nest making. According to Millar, stripers should find an oil that washes out easily, doesn't contain abrasive cleaners and is stable in hot or cold weather. Nisgor recommends using a light-bodied oils like Xcaliber. He also has a trick for brushes that get bent out of shape. "Clean the brush out thoroughly, use hand soap and lather the hair well, shape it, lay it out flat for about a week, rinse the soap out and the brush will be re-trained." Ask a striper what kind of oil they use to retain the shape and moisture of their brushes, and the answer is likely to include anything from Vaseline to Johnson & Johnson. However, some oils are better than others, for a variety of reasons, Xcaliber, Sapphire, and other oils specifically formulated for brushes have the highest recommendation. Dead Brushes Dead Brushes uses Even with the best of care, there comes a time to say goodbye to Old Reliable. Fortunately, there are some imaginative uses for spent brushes. "If a striper was really clever, they could trim it up and see what they could do with it," suggests Bradley. If that doesn't yield any useful results, there's always the fine art route. "I have a magnificent sculpture Pooch (Andy Cappuccio) epoxies, painted, mounted and made out of a single dagger striping brush," says Nisgor. Some stripers find more practical uses for old brushes. "If it's to the point where I really can't work with it, but it's still pliable, I'll hand it over to one of my body shop guys and they can do touch ups with it, " say Mr. J. But for the most part, he just tosses them. 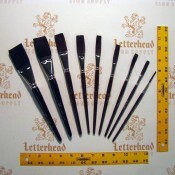 Whether they end up as tribute or trash, well-maintained sword brushes are essential to good pinstriping. Just remember what Nisgor points out: "If you don't take the time to take care of that brush, the brush can't take care of you when you go to use it." information provided by mack brush with permission as distibutor Pinstripe By Hand: Sword and Dager Striping Brushes, Liners, detail brushes. Hand Lettering Brushes: Quills, Flats, Cutters, Fitches, Liners and more.